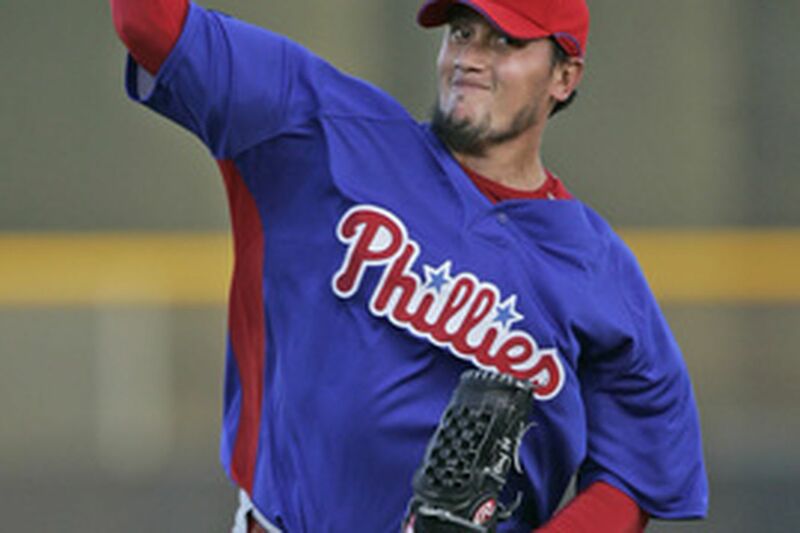 Phillies righthander Freddy Garcia will make his debut tonight after a season-opening stint on the DL. The team acquired him in December. No team in baseball needs a mulligan more than the Phillies. Maybe two days off because of rain and the appearance of Freddy Garcia on the mound tonight will serve as one. At this point, the 3-8 Phillies will jump in whatever life boat they can find, even if its fastball tops out at 88 m.p.h. You remember Garcia. He was one of two guys with that surname who got Philadelphia fans excited this winter. While Jeff Garcia was leading an Eagles renaissance, Freddy caused people to make bold statements like, "We're the team to beat in the National League East." It was his acquisition that fueled December optimism for the Phillies and temporarily had folks overlooking the team's bullpen shortcomings, which still haven't been adequately addressed. Four months after joining the Phils in a winter-meetings deal with the White Sox, and after a season-opening stint on the disabled list, Garcia is ready to take the mound against the New York Mets. The calendar says April 17 and the schedule says Game 12. It's too early to push the panic button, but not too early to start loosening up the ol' index finger. That said, Freddy Garcia will make a very important start tonight - for his team and himself. With two days away, two days to look in the mirror, as Dallas Green likes to say, the Phillies need to come back and start putting something together before they find themselves buried by the time the thoroughbreds come down the homestretch at Churchill Downs. Garcia can jump-start the effort with a good showing tonight. A win would be two in a row for the Phils as they head to Washington with a chance to put a healing winning streak together. Beyond the immediate concern of tonight's game, Garcia needs to make a good showing because all he did in spring training was inspire doubt and concern. The people who traded for him and the people who support this team need to know he is not Andy Ashby or Kevin Millwood. Ashby and Millwood were the last two big starting-pitching acquisitions to fuel optimism in this town. Ashby was a poor fit for frenzied Philadelphia. He lasted less than four months. Millwood hated it here. He stayed two years, went 23-18, and hightailed it with $21 million in his pocket and a bad taste in his mouth. Will Garcia fare better? We'll start finding out tonight. "He needs to get out there on the mound," manager Charlie Manuel said yesterday. "We need to get him going for the season. I think he can be a difference maker." The whole baseball world thought Garcia could be a difference maker for the Phils in December. White Sox general manager Kenny Williams, the man who sent Garcia to Philadelphia for pitchers Gavin Floyd and Gio Gonzalez, predicted Garcia would win 17 to 20 games. Moments after the trade, Manuel said, "I'd say we picked us up an ace." Then Garcia started pitching in spring training and nobody knew what the Phils had picked up. His fastball was lazy. It didn't come around. Finally, he was shut down with biceps tendinitis. Was that the reason he had such a lifeless fastball? Maybe. Maybe not. Scouts who saw Garcia pitch at the end of last season say his fastball was in the 87-88-m.p.h. range all of September. The Phillies had the same reports as everyone else, but they didn't shy away from the trade because Garcia pitched effectively at that velocity in September. In his final six starts of 2006, he went 4-1 with a 2.49 ERA. Over that span, Garcia used his splitter and breaking ball effectively. He pitched, as they say. "He showed he can win by being a pitcher," Manuel said. "We need him to be the pitcher he was last year, and I believe he can be." Nonetheless, the excitement that surrounded Garcia's acquisition has been replaced by uncertainty. How healthy is he? Will his fastball return? Does he have enough to win if it doesn't? This is no interchangeable fifth starter we're talking about. This is the man who was supposed to help the Phillies break their 13-year playoff drought. This is the man who was supposed to join Brett Myers and Cole Hamels in a 1-2-3 punch that was going to make the Phils tough to beat in a short playoff series. "We know we need to win games," Manuel said. "At the same time, I definitely believe we're going to get right back in this. I'm definitely not worried. I don't think we're going to have a losing record for the season. I totally believe we're going to have a good season. We've had a little setback to start, but we'll get it going." Maybe Freddy Garcia helps. The schedule says Game 12, but for him it is opening day. Time to see what you've got, big guy. Mets (Glavine, 2-1) at Phillies (Garcia, 0-0), 7:05 (CN8; WPHT-AM 1210). Yesterday's rainout against the Mets will be made up in June. Sunday's rainout will be made up Monday.